I am a woman, a mother and a professional. I treasure family time with my adult children and my precious grandchildren. I value my deep friendships, some spanning my entire lifetime. As a parent, getting through each day in my corporate world was a monumental achievement. surviving on tic-tacs as I had no time for lunch and barely took a bathroom break. I gained 50 pounds working 90 hour weeks at a start up company. The company fed us non-stop to keep us working round the clock. I understand what not taking care of myself looks like. I’ve been there. It was not a happy place. I don’t ever want to go there again. Staying home with children can be more exhausting than working outside the home. At home you cannot escape to the ladies room - the little ones follow you there. And stand outside the door. Their demands are relentless and the questions are endless. It’s hard to tell breakfast, from lunch, from dinner on the shirt you are wearing inside out. It takes 30 minutes to get out the door to go anywhere. to hold the many crickets he collected and has rolled up in his shirt. Yes this did really happen. Today I am older and feel better than I have ever felt. Today I give myself permission to say NO. NO Thanks to things that do not serve me well. The Gift of NO Thanks has given me new energy and a new life. I am a Life and Weight Loss Coach - helping others say “NO Thanks” to people or things that do not best serve them. I want to help you weed out the draining voices in your head. Making room for thoughts and actions that energize you. I want to help restore drained bodies back to life. 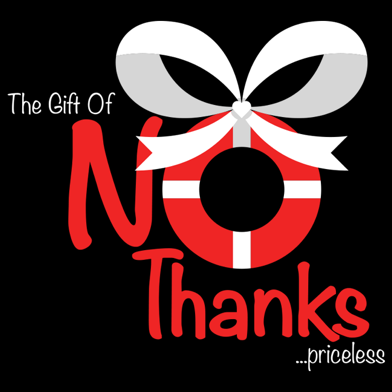 I look forward to sharing the The Priceless Gift Of “NO Thanks” with YOU.